There are signs that American fast food chain Subway may soon be Halal-certified in Singapore. Local media have reported that the US-based chain has shown interest in obtaining Halal certification for their outlets. In a tweet on Wednesday (Jan 31) by halalSG - the Islamic Religious Council of Singapore's (Muis) Twitter handle for Halal food & certification queries - it revealed that there have been a few rounds of discussion with the Singapore headquarters regarding Halal certification. However, it added that "as of now, we have yet to receive any Halal applications from them. So Q at your own risk hor." In a reply to media queries, Subway said that currently, 60 of its branches have stopped selling pork. It has also released the full list of branches that have made the change on its Facebook page. The branches include those at Bugis Junction, Causeway Point, Punggol Plaza, Downtown East and Jurong Point. 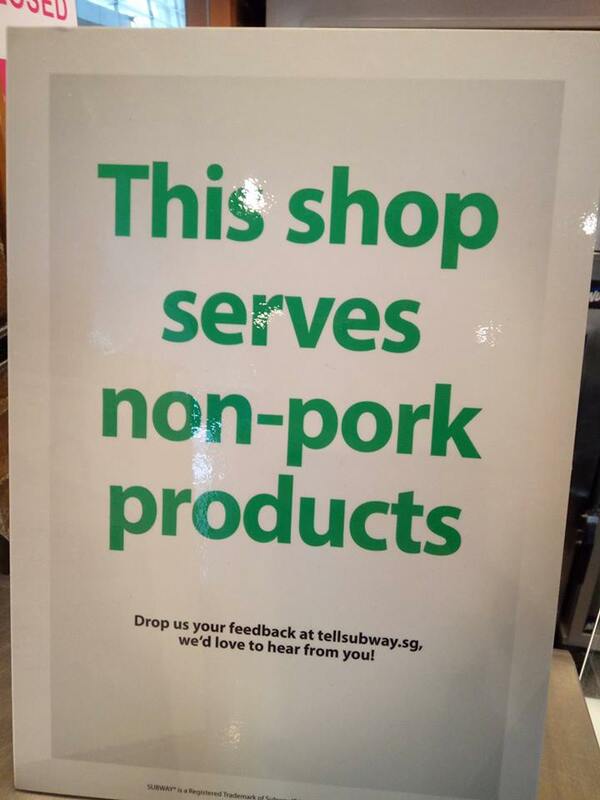 A check with a branch at Toa Payoh Central saw a sign put up, notifying customers that "this restaurant serves non-pork products". Among its ingredients, regular bacon has also been replaced with chicken bacon. However, it is still uncertain if all stores will be affected by the change. Reactions to the news have been mixed, with some customers bemoaning the loss and threatening to "boycott Subway", while others hoped that they'll still be able to get the regular menu in Singapore.